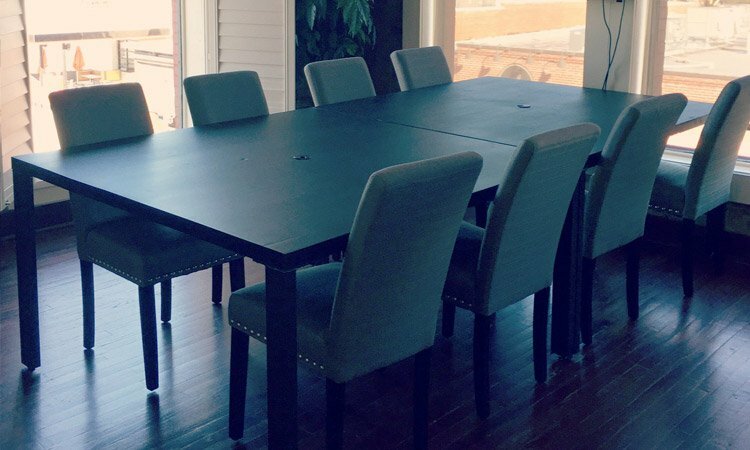 One of the great things about buying custom furniture is that you can decide exactly what size of table you want. 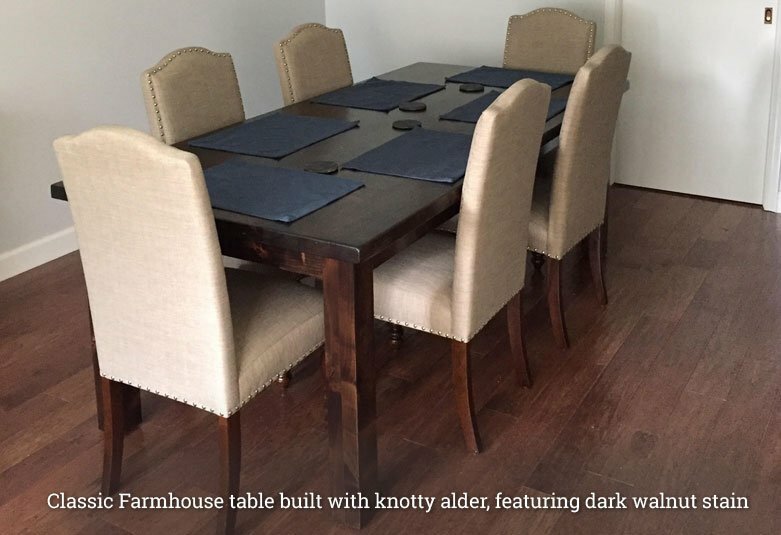 You’re not stuck with the sizes, styles, or height that some faceless manufacturer decided to offer as “standard” for dining room tables. Along with options comes the need to make some choices. 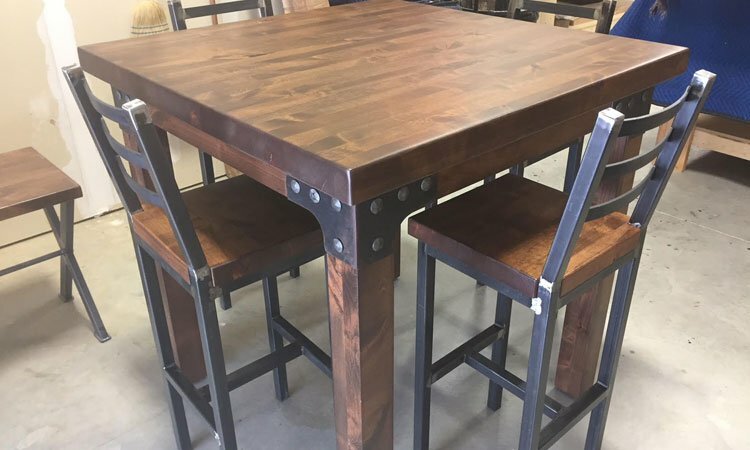 It’s great to have the flexibility to customize your table, but how to do you decide exactly what size of table you want to order? Where’s It Going And Who’s Sitting There? The size of your table is going to depend on how much room you have and how many people you want to sit around the table. A table for a breakfast nook is going to have a much different size than one for a large dining room where you’ll host family dinners. You can determine the best table size for your space by looking at the size of your room and at the number of people you want to seat around the table. How Big A Table Can I Fit? If you want to buy the largest table that will fit in your dining room, then it’s time to get out a tape measure. To get in and out of chairs comfortably, you’ll want at least 30-36 inches of space between the edge of the table and the walls of the room. If you prefer the room to look less crowded, leave 42-48 inches of space around the table. Remember to adjust your measurement to take into account any other furniture in the room, such as a china cabinet along the wall. If you want to use an online room-to-table size calculator to make things easier, click here. How Many People Do I Want To Seat? If you know how many people you want to seat around the table, then you should calculate dining table size based on seating area. Here’s a link to an online calculator that can help. It’s generally recommended that you allow 24-28 inches of table space per person seated at the table. That can vary depending on how much space seating takes up. Benches let you fit more people around a table, while chairs with arms will take up more room. You’ll want to figure up how large of a table you can fit in your space as well as how large a table you need for the number of people you want to seat. If the two table sizes come out close to the same, then that’s the size table you’ll want to order. If the size of table you can fit and the size of table you’d need for the number of people you want are different, then you have a decision to make. You can either go with the largest size your room can accommodate (if you want to seat as many people as possible) or go with the smaller of the two sizes (if you don’t plan on having large groups of people at the table). 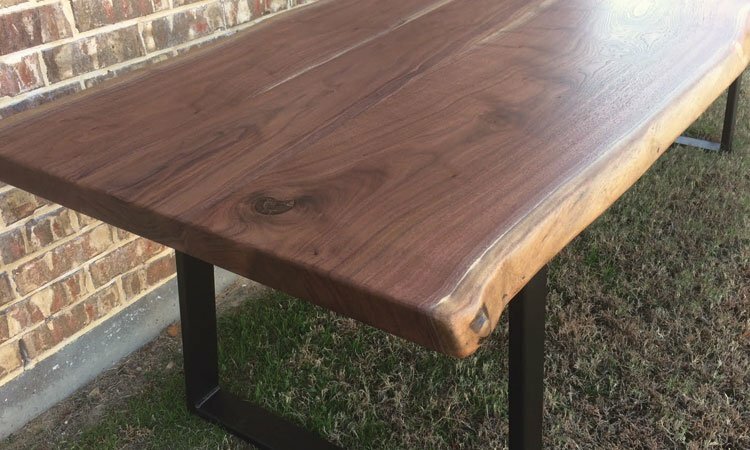 When you order a table through Rustic+Modern website, you can choose several options for table width and length. If you don’t see your preferred size as an option, just contact us. We’ll be happy to discuss your request and work with you to create the perfect table for your needs. 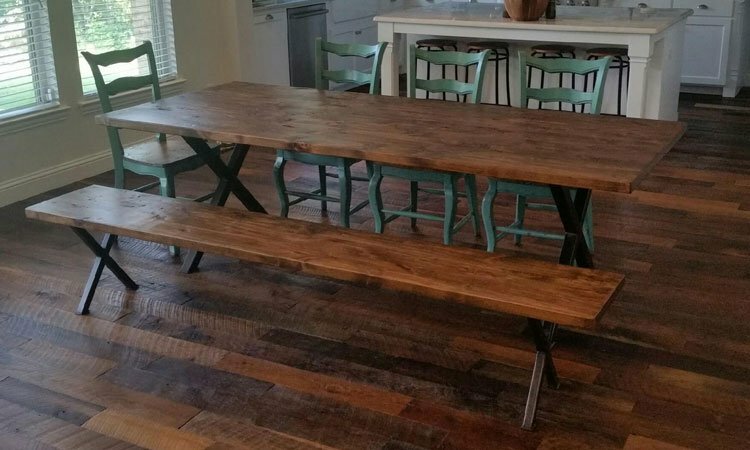 As the reuse/recycle trend keeps becoming more popular, we’re starting to see reclaimed wood furniture talked about more and more often. 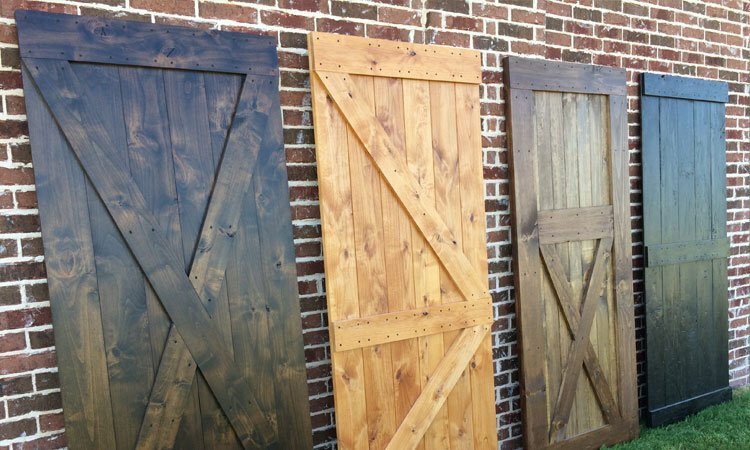 Whether it’s DIY patio furniture made from wood pallets or a beautiful table crafted from old barn siding, reclaimed wood is quite popular today. But why? What is it about reclaimed wood that makes it such a good choice for furniture like the customized tables we offer here at Rustic+Modern? Keep reading to discover five great reasons to love using reclaimed wood furniture in all your decorating projects. All custom wood furniture can add character to a room, but there’s something extra special about wood with a history. Imagine sitting down for dinner at a table made from wood older than you (or perhaps even your parents)! Reclaimed wood is also evidence that objects can become more beautiful as they grow older and become marked by the passage of time. There are cases where reclaimed wood isn’t safe to use because of insect infestation, chemical contamination, or decay. But if you’re buying from a reliable source, reclaimed wood is perfectly safe. In fact, it can be higher quality than new wood because older woods often came from old-growth trees. For example, most of the reclaimed wood we use is longleaf pine that’s 100+ years old. It’s also called “Heartpine” because of its large heart center with minimal surrounding sapwood. This heart section is very dense and is unrivaled in beauty, strength, and durability. Using reclaimed wood lets us cut back on the demand for new trees being harvested. It’s also a much more eco-friendly alternative to putting wood that’s been used before in a landfill or burning it. And when you use local wood, you’re not burning lots of fossil fuels during transportation. 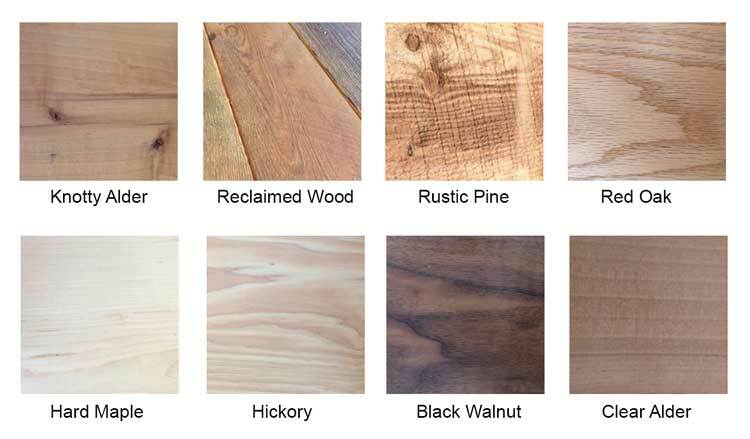 Rustic+Modern’s reclaimed wood is harvested locally, and it does qualify as environmentally friendly. 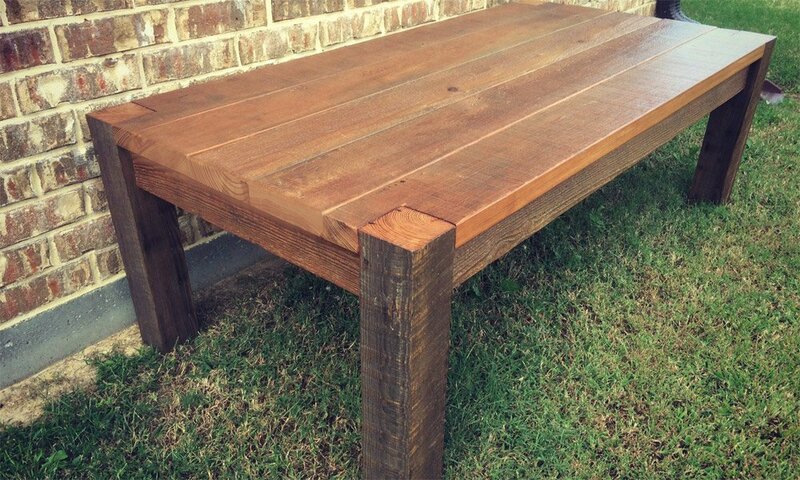 Reclaimed wood furniture comes to you with a history. The wood used to build this furniture used to be part of a home, barn, or other structure. It’s durable wood that has already stood the test of time. That doesn’t mean it’s indestructible, but it’s pretty easy to take care of reclaimed wood so it will last for many years to come. Since reclaimed wood furniture is so unique and eye-catching, there’s a good chance guests visiting your home are going to comment on it. They may even ask where they can get something just like it. You’ll have to tell them it won’t be just like yours since each piece is unique, but you can spread the love for reclaimed furniture. Just get in touch with us here at Rustic+Modern to order a reclaimed wood furniture piece for yourself, or if you’ve already got one you can pass our information on to that friend who’s admiring your furniture. Good-quality, solid-wood furniture is an investment, one that you want to use and enjoy while also keeping it in good shape. To do that, it’s important that you follow a few easy tips for wood care. When you take care of your wood furniture properly, there’s a very good chance it will last long enough to become a family heirloom. The good news is, wood furniture care isn’t hard once you know how to do it. Here are our 5 expert tips for wood furniture care. The natural woods used in solid wood furniture are sensitive to temperature changes. If you place your furniture in a cold draft, right by a heating vent, or in direct sunlight it can warp the wood. To keep the wood in good shape, locate your furniture away from heating and cooling vents. 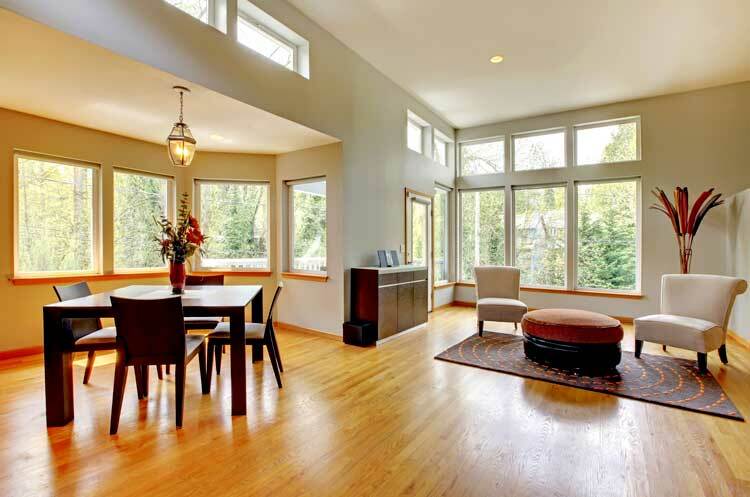 If there are lots of windows in the room, put up curtains to shade the wood from direct sunlight. Did you know dust can actually scratch wood furniture? If you let the dust particles build up, they can leave little scratches and marks in the wood finish. To keep this from happening, all you have to do is wipe down the furniture with a soft cloth about once a week. You can use a damp or dry cloth. Just make sure that you wipe in the direction of the wood grain and that you dry it off afterward if you use a damp cloth. Most of the time when you need to clean your wood furniture, a soft dry cloth will do the trick. You can also use a cloth damp with clean water or a mild solution of dish soap. You’ll want to avoid most wood-cleaners, especial if they’re silicone- or ammonia-based. Instead, invest in a high-quality wax-based furniture polish. We recommend using Howard Feed-N-Wax Wood Polish and Conditioner about once a month. You don’t have to keep the table’s surface covered all the time. After all – one reason you probably bought this furniture is that you like the look of the wood. But you should use coasters, hot pads, trivets, mats, etc. to protect the wood’s surface from hot pots and pans or cold drinks. You don’t want the wood damaged by temperature changes, moisture, or with scratches. Much like temperature changes can warp wood, so can extremes in humidity. A humidity level of 40 to 45 percent is ideal. Running a humidifier when the air is dry will keep the wood from drying out and shrinking. In some climates, you might need to run a dehumidifier or air conditioner during the warm, humid months to keep the wood from swelling and warping. 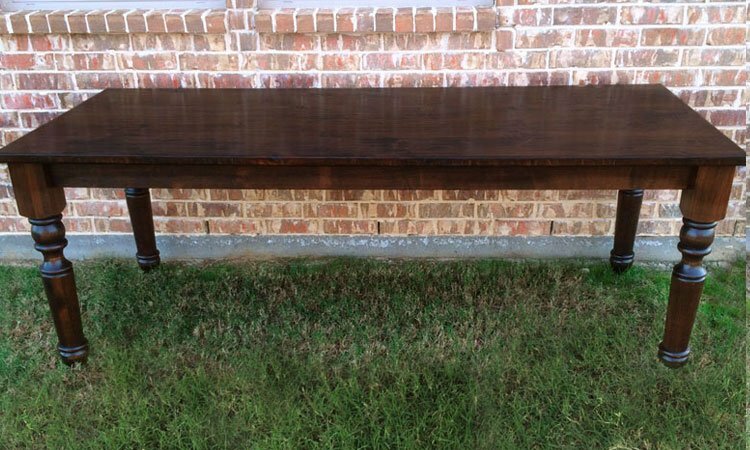 If you’re looking to purchase a high-quality wood furniture piece, Rustic+Modern is the place to go. We’ll work with you to create the perfect custom piece that’s the right size, wood, and style for what you want. Contact us today to learn more or get started with an order. What’s the most important piece of furniture in your house? Is it the couch you sit on when watching Netflix? The bed where you sleep away nearly 1/3 of your life? 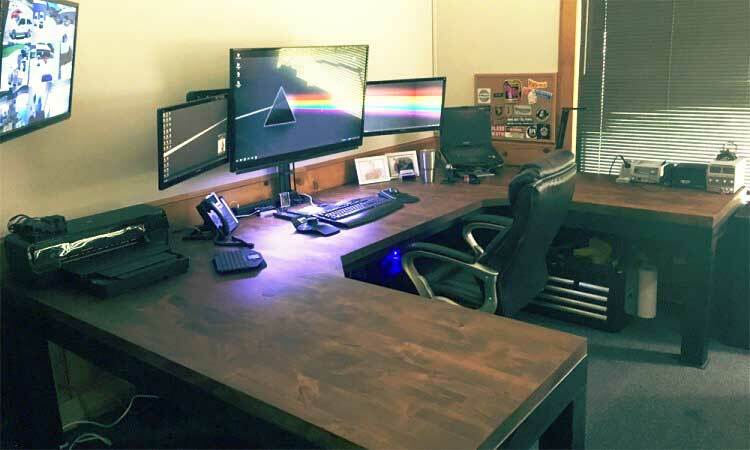 The desk where you sit and work? Or maybe it’s the dining room table. Dining tables often act as a central gathering place and become one of the best places to build good family memories. And if the dining room table really is one of the most important pieces of furniture in your house, then you’re definitely going to want one that’s good quality. 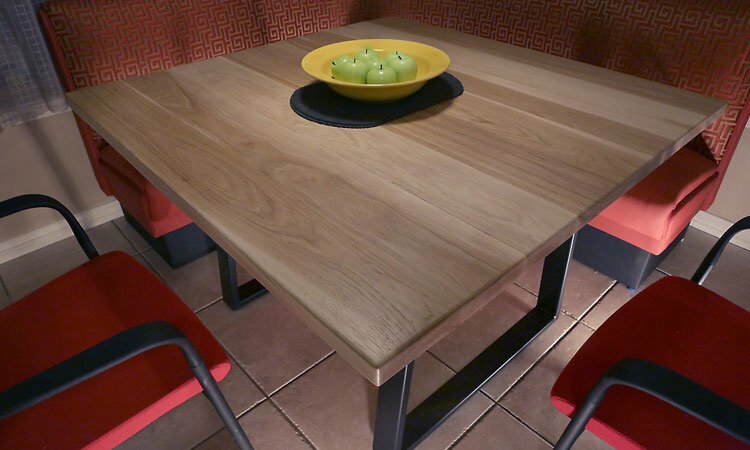 Here are 5 reasons why you need a good-quality dining room table. Historically, eating meals together has been a time of community and relationship building. Now, experts are saying that eating family meals together lowers stress, promotes good health, and helps students get better grades. A good quality dining room table is the platform for family bonding. Dining room tables aren’t just for eating. They’re often where the kids do their homework, where families gather to play games together, and where you hold celebrations like birthdays and holidays. They’re also a place you go to sit and visit with friends. A beautiful table that fits your dining room space provides the perfect backdrop to strengthening your relationships. When you have guests over, chances are good you’re going to end up at the dining room table. Whether it’s a friend dropping in to chat or a huge family dinner, there’s a good chance you’ll all be sitting down at the table. Wouldn’t you rather have a beautiful table to show off to your guests? Since dining room tables see lots of use, it’s important to get one that’s good quality. When you invest in a well-made, solid wood table you can be sure that it’s going to continue serving its purpose for many years. Wood tables often become heirloom pieces, continuing their role of bringing families together for several generations. You can’t say the same thing for cheaply made tables. Investing in a high-quality dining room table lets you make sure you’re getting a table that matches your family’s decorating tastes and personality. 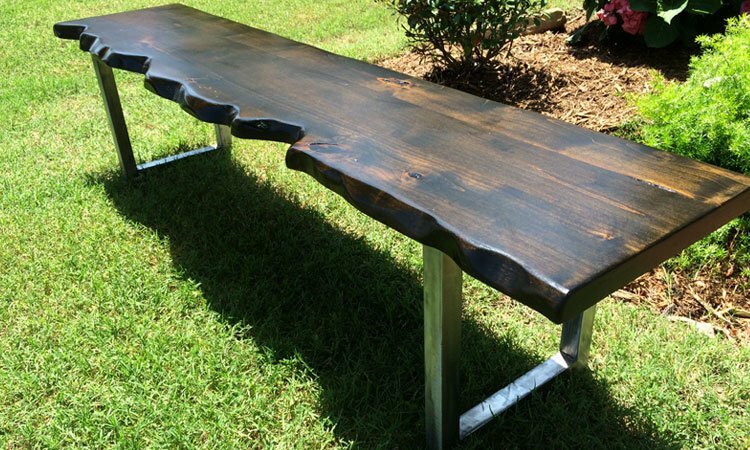 Here at Rustic+Modern, you get to customize the style, wood type, finish, and size of the table. It’s fit perfecly into your dining room and give your family everything you want from a dining room table. 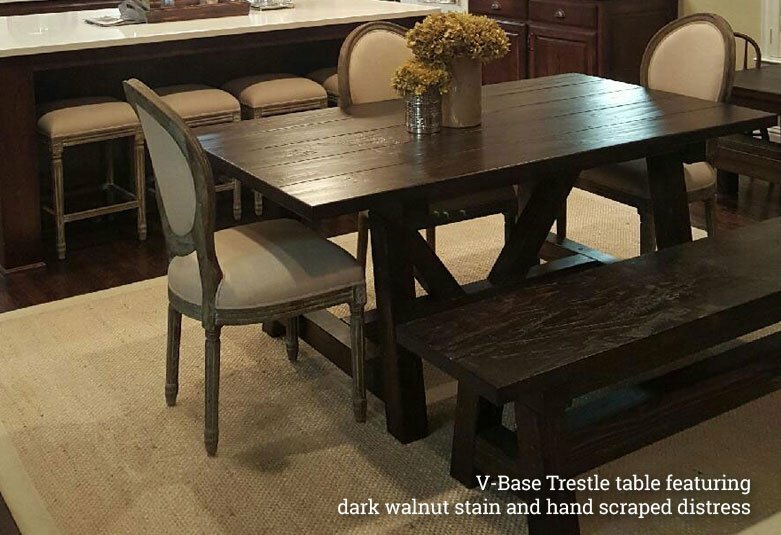 You can get your own top-quality dining room table right here at Rustic+Modern. Click here to take a look at the styles we offer. You can order from our website, or click here to contact us directly with questions and special requests. We’re looking forward to hearing from you! If you’ve got a little extra space in your kitchen or a corner you’re not quite sure what to do with, why not turn it into a breakfast nook? A cozy little nook with seating and a table might quickly become your new favorite place to settle in with a cup of coffee and your morning reading before you take on the rest of the day. You might even like it so much you want to eat more meals there than just breakfast. While you can just toss a table and chair in the corner and call it a breakfast nook, putting a little more effort into it will make for a much cozier place to spend your time. Here are a few tips for how to set up your very own comfy breakfast nook. The ideal spot for a breakfast nook is a well-lighted corner of the kitchen or dining room. Windows are a plus, though not essential. If you have a bay window it’ll make the perfect location for a cozy little nook. But if not, no worries – any corner will do. For example, you could cut one of the countertops off before it hits the wall to save a corner for an L-shaped bench. Or you can set up a small, round table in an open spot at one end of your kitchen. Even if you do have nice windows, you’ll still want lights in your nook. They’ll be a big help on cloudy mornings or if you want to relax in the nook during the evening. Pendant lights hanging over the nook are a popular choice and there are plenty of different kinds to choose from to fit with your decorating style. Many breakfast nooks make the most of a small space using benches. It takes up much less room to put a bench along the walls than to leave room to scoot chairs in and out. Plus, you can add hidden storage in the benches. If there’s enough room around the table, you could use chairs instead of or in addition to benches. Picking out decorations for your breakfast nook should be fun. If you already like the way your kitchen is decorated, just continue that theme into your nook. Or you can use setting up the breakfast nook as an excuse to change the look of your kitchen. Try to choose easy-clean fabrics for the chairs and benches just in case you spill coffee or something. The table you pick is going to depend on the size and shape of the space you have available. Sometimes breakfast nooks are odd shapes, so it helps if you’re working with custom furniture makers like Rustic + Modern. We’ll help you customize a round, square, or rectangular table that’s perfect for your breakfast nook. It’s good to have options. But when you have a whole lot of different options it’s sometimes hard to decide exactly what you want. Here at Rustic + Modern, we strive to create the perfect customized products for your needs. You get to choose from a variety of customizations including style, size, and wood type. But those aren’t the only options you have. You can further customize your furniture, barn doors, accent walls, and other items with different finishing options. These help make your piece unique and ensure it complements the room where you’re going to place your new furniture. So here’s a quick overview to help you pick which finishing touches to place on your order. You get to decide whether you want your finished piece to have a smooth finish or some texture to it. If you opt for smooth, you’ll be able to see all the beautiful wood grain and texture but when you run your hand over the surface it will feel smooth. 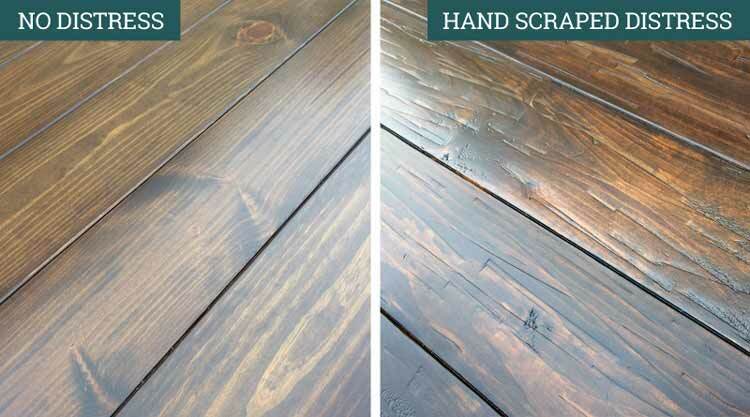 If you want your wood distressed, we can add a scraped or hammered effect. This wood will look and feel textured when you touch it. However, we’ll still finish it off so that there’s no risk of splinters or snagging from the distressed finish. We offer natural and hand-carved live edges as an option for things like tables, desks, fireplace mantles, and countertops. This creates a unique look along one or more edges of the wood surface. Alternately, you can choose traditional straight edges along all four sides of your table. If you do opt for a live-edge, you’ll get to choose the type of carving as well. We can do a more subtle look as well as deeper, more dramatic carving. It’s up to you. If you want to enjoy the natural color of the wood you picked we apply a high-quality clear coat finish. This type of finish enhances and protects the beautiful color and wood grain. We can also stain most woods if you’d like that (please note that we do not stain reclaimed wood, hickory or black walnut). There are several reasons you might want to stain your wood. Perhaps you want a certain type of wood because of its price or durability but it’s not the color you need. Or maybe you like the grain of one wood but need it stained to match the other furniture in a room. We’ll be happy to help you pick out the right stain and finish your furniture with that color. Simply contact us to learn more about the stains colors we offer, schedule a visit to our design center, or order your very own custom furniture piece.